Since 1995 we have been the authorised dealer of DATAMAX, the American manufacturer of high quality thermal and thermal transfer printers. Our printers are being used in numerous maunufacturing facilities, often working in a very harmful environment. We have label printing solutions which will meet every company's demands. Among the companies using our printers are production enterprises, retailers, offices, advertising agencies, laboratories, farms, etc. We support our customers with installation, training, software and service. We also offer the whole list of options for Datamax printers that can increase their efficiency, including: external label rewinders, cutters, slitters, etc. The Datamax E-class Mark II and MARK III family is designed to be the printer of choice when value, performance and features are the primary printer requirements. E-class printers are capable of printing a wide variety of labels in apolications ranging from small office shipping requirements to compliance and general purpose product identification labels and tags. Datamax M-Class printers are rugged, sturdy printers developed for use in bar coding applications where space, reliability and performance are the motivating factors. The Datamax I-class printer line is the most comprehensive, cost – effective industrial label printing solution available in the thermal printer marketplace today and will continue to provide the same exceptional value into the future. The Datamax W-class Family of printers was designed to address the specialized printing needs of applications where wide label formats are industry-standard requirements. The Datamax S-class was defined to enable Datamax to apply engineering expertise and experience to a specific niche industry. 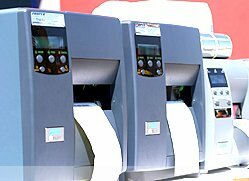 Datamax cooperates with many ticketing solutions providers to ensure that the S-class printers are compatible with the leading ticketing and admission software.